Submitted by SCAW Volunteer Karen Scott. SCAW is operated by volunteers, from the processing of donations to the distribution of bedkits. Our financial structure ensures that 100% of every bedkit donation reaches a needy child. We neither receive nor request funds from any level of government. Grants provide a very important way to spread the word about SCAW and means by which more needy children can benefit from the comfort of a good night’s sleep so that they will go to school and have hope for the future. This is the story of one grant. As a Senior Program/Project Manager by profession, I volunteered for the Project Management Institute (PMI), a global organization of more than 500,000 members headquartered in Newton Square Pennsylvania. As recognition of my service, in late 2014, funds in the amount of $1,000 US became available to me to designate to the charity of my choice. Of course, I chose SCAW! In order to secure approvals for disbursement, senior level PMI staff were involved and several weeks were required to complete the process. SCAW received the funds just in time to include the donation in the Togo 2015 distribution on which I served as a team member. The joy of seeing 37 beautiful children as recipients of bedkits from this grant was indescribable and emotions overwhelming. My associates at PMI had not previously heard about SCAW. They were impressed by everything about us – our dream, our mission, our core values, and the work we have done to date to distribute more than 1.4 million bedkits to needy children living in abject poverty in the developing world. For more information, please go to the SCAW website and check out our blogs. The circle of giving was completed and the word about SCAW was spread far and wide. 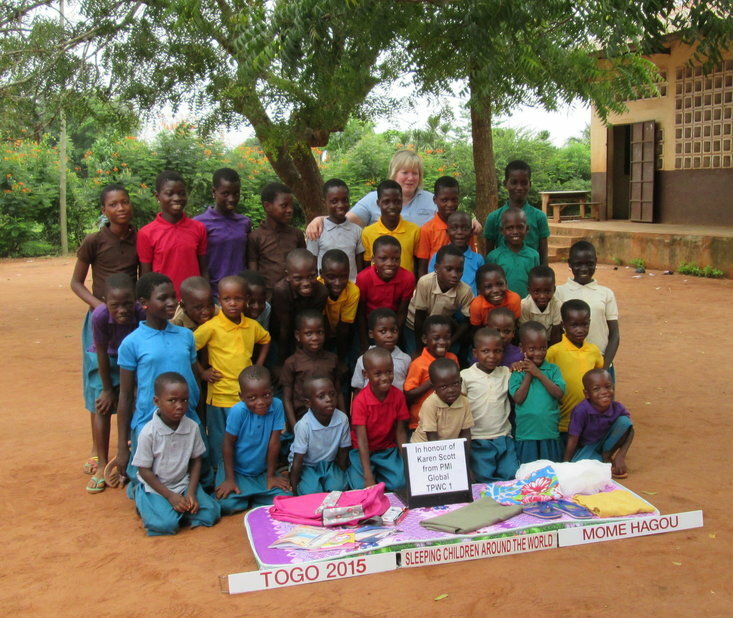 37 beautiful Togolese children immediately benefited. Countless more children will be beneficiaries in the near and distant future. Please consider how you may be able to acquire a grant to continue to support SCAW and give needy children the gift of hope. For the Children – thanks! Pour les enfants – merci!